No commitments to divulge since our last update. The board currently stands at 20 verbals, and it can be seen here. But some interesting news has been coming out of AA. Michigan head coach Rich Rodriguez said, as we reported last week, that he fully expects to sign a full 25 member 09 incoming class. Word was, back in November that Rodriguez was quoted saying that he thought he could get about 20 to 23 guys by signing day. Clearly, he and his assistant coaches are hot and heavy on the recruiting trail, and things are looking good. How good, have a look at who was in attendance for Michigan's big win against Duke last weekend at Crisler Arena. From left to right: William Campbell, Teric Jones, Isaiah Bell and Fitzgerald Toussaint. That right there represents the bulk of some of the best talent that the 09 class boasts. The only question mark is William Campbell, who was verbally committed earlier this fall, but re-opened his recruitment. However, seeing him sitting with 3 other verbal is a very good sign for Michigan. Last weekend was a big recruiting weekend for Michigan. 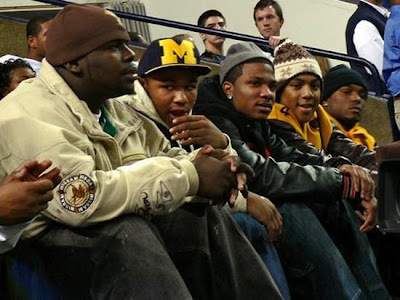 Seven total recruits were in attendance for the basketball game. All of which were reported to have rushed the court after the game to celebrate. Including Michigan verbal commit Justin Turner, a 4-star DB from Ohio. "The atmosphere was crazy. There were a whole bunch of fans there and when we beat Duke, the whole student section just rushed the court and me and the other recruits rushed the court with them." Also making his first trip to AA was DE JUCO-transfer Pernell McPhee (6-4, 270), who committed to Mississippi State this summer, but with the stepping-down of Sylvester Croom, Michigan now tops his list of schools. He's also a former HS teammate of WR Martavious Odoms.